Onions are ready to pull. if you have not already; the ones in front were multi-sown in modules indoors in March and have cropped more healthily than onions grown from sets. This summer’s weather has been so different to last year, affecting so much in the garden- including what we may sow, plant and harvest in August. Consistent warmth and dryness has encouraged many more insects, even some aphids on the fruit of courgettes which I have not noticed before (they can be washed off at picking time). Brassicas are suffering the most insect damage, even the ones I am growing under mesh. By contrast I noticed much better growth of brussels sprouts and cabbage in a neighbour’s garden under fleece, which is more effective at excluding flea beetles. The little beetles love dry weather and have caused much damage so far, but should abate from now on, as they go relatively dormant from August until next spring. Currently I am planning to use fleece (not mesh) for a mid August planting of calabrese and chinese cabbage, which are to be sown right at the end of July. No insect damage here though – the eggs of carrot root fly have perhaps had difficulty in descending through dry, hard soil. These roots are from an experiment to compare results of sowing on a root day and an unfavourable day, moon-wise. The differences are not great although the root day harvest was a little heavier, at 1.8kg from a four foot row. Soon after that I shall be sowing oriental leaves for salad, such as mustards, mizuna and pak choi, as well as rocket and turnips. Also some more endives for leaves in October, November and even December outdoors. After mid month it should become easier to grow healthy leaves in open soil, although I expect some watering will still be necessary. When sowing in dry soil, draw out a drill slightly deeper than usual and water along it, thoroughly, so as to make a damp line in which to sow the seeds, before covering with dry soil. Germination should then be rapid, with no slug damage! Soft fruit has loved the sunny weather, we picked 7kg blackcurrants off one bush, hours of picking and a labour of love. 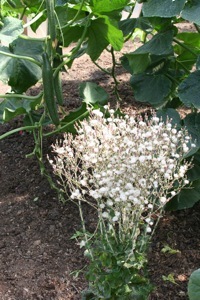 Many vegetables have flourished in the extra sun and warmth, especially when given water. I have had superb pickings of lettuce with almost no slug damage and little mildew; leaves are glossy and firm. Tomatoes are ripening more readily than in recent summers. I do not feed my tomatoes that are growing in well manured soil; they find enough goodness to set four or five trusses indoors. But if your soil is in need of building up with organic matter, some waterings of whatever feed you like to use will help the plants, until about month’s end when new growth, especially outdoors, is slowing. 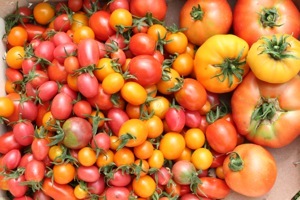 Also I suggest you pinch out the main growing point(s) of tomatoes from mid August, to encourage more swelling and ripening of fruit – but avoid excessive de-leafing as this hinders growth of new fruit, and does not speed ripening if too many leaves are removed. I reckon to remove just leaves that are yellowing, and all those below the lowest fruit truss. The dry conditions have helped to diminish weed growth and,unless you have been detained elsewhere, soil should be clean around your crops. If weeds have got ahead of you, what about growing on a smaller plot next year, making it easier to manage? Or growing simpler vegetables such as courgettes, potatoes, kale and other widely spaced plants which can be mulched around to suppress weeds? Then you will be on the way to having cleaner soil for easier growing, especially if you spread a mulch of compost as vegetable harvests finish in the autumn, instead of digging the plot. Lastly a reminder to sow lambs lettuce at month’s end, also spring cabbage in the second half of August, in a seed-tray or row outside, aiming for sturdy plants at the end of September. 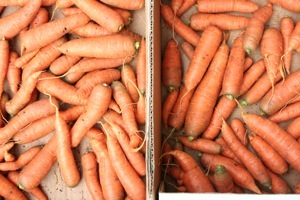 They can go in where many other vegetables are finishing at that time, such as dwarf beans, salads and summer carrots. Other jobs for August include cutting off all top growth of strawberry plants. The photo shows re-growth already happening where I cut all leaves five days earlier. Also it is soon time to harvest lettuce seed, the photo shows a plant of Mottistone in a polytunnel, almost ready for cutting its stalks and rubbing out the thousands of seeds. Changes in the weather remind us that summer is drawing to a close, such that some seed-sowing thoughts are now turning beyond winter harvests and towards next spring. 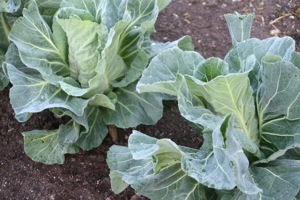 The last week of August is an excellent time for sowing spring cabbage, either in open ground, or in modules or small pots, or in a seed tray for pricking out. I prefer the latter because brassica seedlings are extremely variable in quality, so pricking out enables me to choose the strongest ones, lifting them gently with a pencil when at the two leaf stage and then burying all the roots in the compost of a module tray, as well as most of the stem, to make a sturdier plant. Hold seedlings by the leaf or leaves when doing this. Planting them around the season of equinox in September is about right to allow time for establishment and some growth, without them growing too large or even maturing into small hearts before winter sets in. 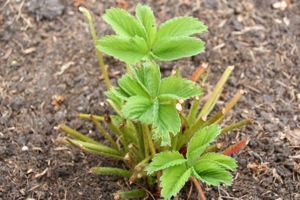 The idea is to have a small to medium sized plant through winter which can then heart up in April and May. Spring onions can also be sown now, for overwintering. I sow eight seeds per module and plant them out in a clump after about four weeks, or you can sow direct in soil that has not too many weed seeds, as onions are slow to establish and are easily smothered by weeds such as grass and chickweed. You can also sow Japanese onions for overwintering, which is a way of having bulbs to eat from about late May, earlier than spring sown onions. BUT I have found that these plants harbour mildew and then pass it to spring sown and planted onions, severely curtailing their growth and minimising the chances of storing them. Since I stopped growing Japanese onions overwinter, my main harvest of summer onions has been far healthier and larger. 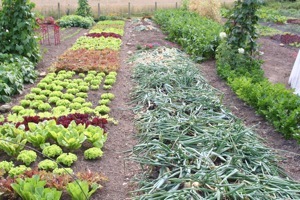 Fortunately, salad onions such as White Lisbon do not seem to carry the mildew over winter. 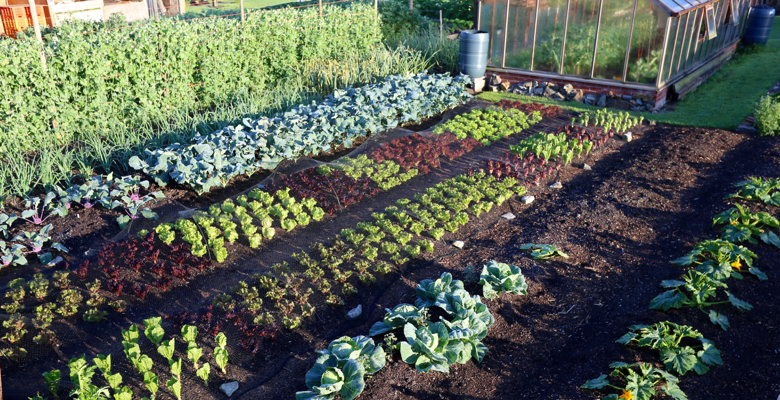 Salads for picking outdoors in October and possibly up to Christmas can still be sown, as soon as possible – such as rocket, mizuna and leaf radish. Also wild rocket for the spring because it survives winter more strongly than salad rocket, then re-grows healthily from April to June, from sowings made now. Other salads for over-wintering outside, to sow now, include lambs lettuce, land cress and winter purslane. They should harvest most strongly from about February to April. 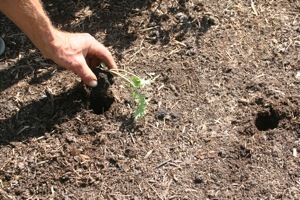 Then in early to mid September it is the best time for sowing winter salads to grow indoors, more on that next month.